Artist Statement: I create Plushies, otherwise known as Huggable Art. I enjoy creating toys that make people smile. I grew up helping my Oma (German for grandmother) with local charity organizations and it shaped me into the person I am today. Even though she is no longer with me I still continue to share what we started together, giving comfort to others in little ways. I love to see people smile when they see my toys; it is what drives me to continue on the path I have chosen for my art, the huggable kind. When I create a toy I think about how people will feel when they see it. While working on a sketch or with the fabric I try to bring it to life in a way that will affect others in a positive manner. I keep most of my toys safe for little ones by using safety eyes and embroidery to avoid choking hazards. I love how the light reflects off of safety eyes to give them a bit of life, or an embroidered crooked smile makes them a bit mischievous. By keeping the toys kid friendly they can be a great comfort for all ages, because no matter how old we are there is still a little kid in each of us. 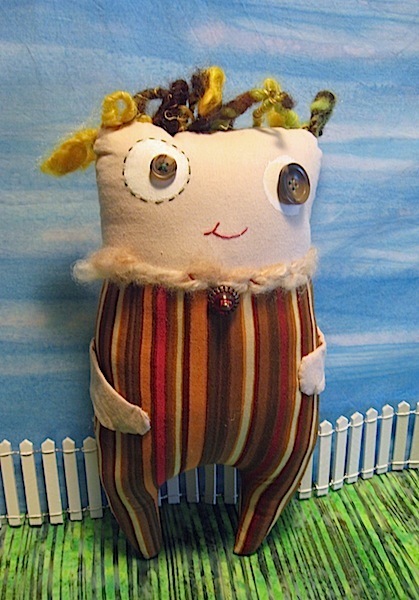 The use of fabric and fibers helps keep the toys huggable, we all need a hug with a special friend from time to time. Exhibits / Awards: I have shown at the University of Michigan Hospital for their Employee Art Exhibits in 2010 and 2011. Winning Honorable mention in 2010 and Best in Category 2011 for Fiber art. I have also shown at the University of Michigan Hospital as an individual artist for my plushies which included Amigurumi, Peculiar Poppets and Peculiar Poppet Mermaids.